Nine defectors from North Korea have been rescued off the coast of northern Japan after a five-day voyage in a small boat. 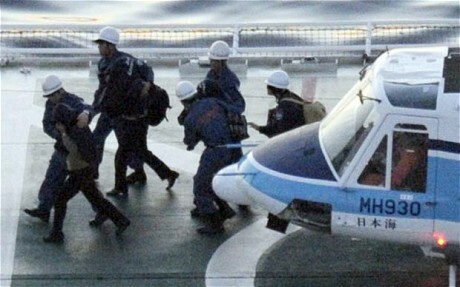 The three men, three woman and three young children were put ashore from a Japan Coat Guard patrol vessel late on Tuesday evening and later transferred to an immigration facility in Nagasaki Prefecture. One of the men told authorities that the group was related and had set sail from a North Korean port on Sept 8. They were trying to get to South Korea in the 26-foot wooden craft and planned to seek asylum there. The defectors, who had not been named, had been spotted by Japanese fishermen but had run out of fresh water and only had small amounts of rice and pickled vegetables when they were found. The Coast Guard said only around 13 gallons of fuel was left. None of the nine had a life jacket. The family is the third group of North Korean defectors to make it to the coast of Japan. In January 1987, a boat carrying 13 North Koreans was washed ashore in Fukui Prefecture and later continued on to South Korea via Taiwan. In June 2007, another four came ashore in Aomori Prefecture before going to Seoul. The Japanese government is expected to again permit the defectors to continue their journey to South Korea, on humanitarian grounds, and officials in Seoul have already said they would welcome the group. One of the men told Japanese authorities that he was a member of the North Korean army. Reports from within the secretive state suggest that the near-starvation conditions that have affected the civilian population in recent months, since the harvests were decimated by flooding this summer, have now spread to the military.